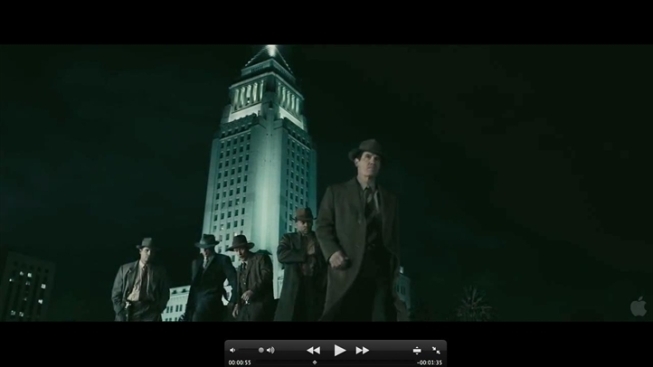 The first "Gangster Squad" trailer has arrived, bringing with it a hyper-stylized look, a hail of bullets and a deep bench. And we'll warn you, Ryan Gosling's working a really weird accent in this one. The film stars Sean Penn as Mickey Cohen, the boxer-turned-mobster who in the 1940s was sent by the New York mafia to conquer Los Angeles. A little too successful in his endeavors, he draws the attention of the LAPD, who put together a black-ops team of cops ("No arrests") led by Josh Brolin and Gosling. Rounding out their band of thug hunters is Michael Pena, Robert Patrick, Anthony Mackie and Giovanni Ribisi. And because this is a movie about gangsters, there's gotta be a dame--here played by Emma Stone. Seriously, what's up with Gosling's vaguely effete voice? Yes, he needs to get away from his De Niro-esque vocal stylings, especially in a mob movie, but that squeak could get really annoying. We'll see. The film is entirely live-action, but because to the saturation and lighting, its look evokes the style of Robert Rodriguez's "Sin City." Director Ruben Fleischer ("Zombieland," "30 Minutes or Less") typically has a certain amount of flair, but he's really going for it in "Gangster Squad," borrowing flourishes from all over Hollywood and the world of video games. Which is to say it looks great. "Gangster Squad" opens Oct. 19, and we are stoked.